The World Food Programme (WFP), the food-assistance agency of the United Nations, was established in 1963 to fight global hunger. WFP has many partners, including the Food Aid for Development (FAD) Office of the World Health Organization. The goal of this combined effort is to ensure that everyone has access to nutritious foods at all times. Food-for-Life. Eighty percent of WFP resources are used by this program for emergency relief activities for refugees and displaced individuals. Food-for-Growth. Projects in this program aim to prevent nutritional problems among pregnant and breastfeeding women, infants, school children, and the elderly. Literacy and nutrition classes are also offered. The Food-for-Work program offers food to hungry people in exchange for work they do to improve vital infrastructure. 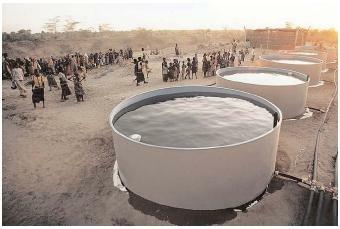 Here, Somalis gather around water tanks, which were built to stabilize the water supply for drinking and irrigation in the drought-afflicted country. dykes, terracing hillsides, replanting forests, and repairing irrigation systems. SEE ALSO Famine ; Food Insecurity ; United Nations Children's Fund (UNICEF) . Barrett, Christopher B. (1998). "Food Aid: Is It Development Assistance, Trade Promotion, Both, or Neither?" American Journal of Agricultural Economics 80(3):566–582.